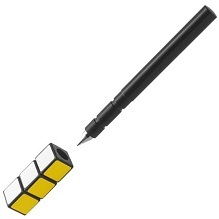 These Rubiks Cube Pens are absolutely ingenious quality personalised ball pens. Match the three colours to 'unlock' the pen lid itself, and this added fun to the product is what makes it so unique compared to any other promotional ballpen or stationery item. twist - action fun with a practical element, printing down the barrel of the pen and a customisable choice of yellow, red, green ,white or black for the colour of the pen itself!! For a FREE QUOTE, please fill in the form regarding our Rubiks Cube Pens and we'll be able to help you. Why not have a look at our other promotional gifts?